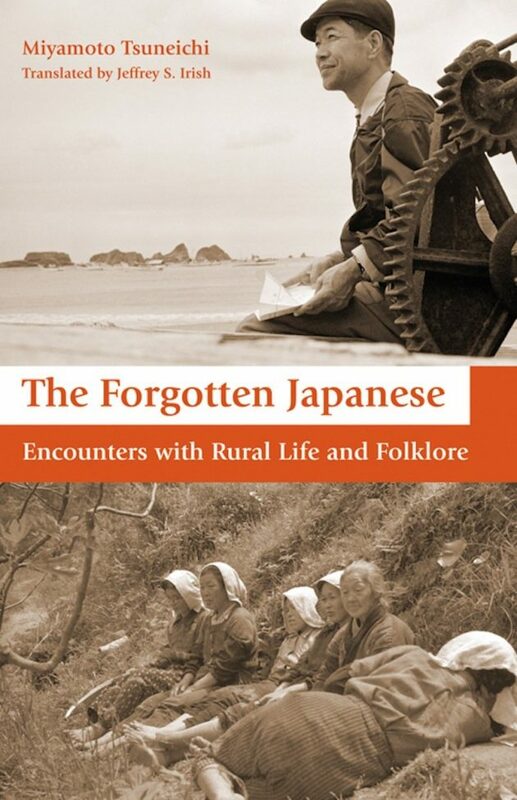 The Forgotten Japanese: Encounters with Rural Life and Folklore. Miyamoto Tsuneichi, translated by Jeffrey S. Irish; Stone Bridge Press 2010 hardback, 315pp. The Japanese ethnologist Miyamoto Tsuneichi (1907-1981) walked more than 100,000 miles, mainly during the 1940s and 50s, gathering reminiscences of rural life from village elders. Their stories go back to Meiji times, yet Jeffrey Irish’s down-to-earth translation (excerpted in KJ 63, “Chasing Folksongs”) brings individual voices to life, recreating a pre-industrialized Japan that we could otherwise scarcely imagine. Reading this book brings us face to face with the unromanticized reality of what it means to be dependent on the natural world, and reveals the physical effort and perseverance that was taken for granted in those days. These small local communities were, however, strikingly non-parochial — a surprising number of people, including young women, used to travel, on walking pilgrimages or as itinerant farm laborers in harvest seasons. The individual components of life here had not been influenced by Western learning or thought, and showed few signs of samurai Confucian morals either. Rather, they appeared to have come from a way of thinking that preceded these things. The importance placed on ties between individuals — within families and the village as a whole — and a commitment not to betray unseen gods are what gave order to these people’s lives. Miyamoto’s deep respect for the enlightened village headmen and schoolteachers he met, people who made extraordinary efforts to improve regional economies and villagers’ lives, is evident throughout. Miyamoto, too, as a government-appointed advisor, contributed a great deal, advising local communities to concentrate on local meibutsu specialties. He was also fascinated by traditions such as local-level decision-making through democratic village meetings, and the “mediating grandmothers” who gave unobtrusive support to younger village women. It would be difficult to find a translator better qualified than Jeffrey Irish to undertake this project. An ethnologist by training (grad school, Harvard), he has written three books in Japanese. Island Life (also published in English) describes his experiences working as a fisherman on an island off Kyushu; Sasuraibito kara no tayori (Letters from a Wanderer) is a collection of essays about life in a rural mountain village; Senzen no Kagoshima: Satoyama no Hareta Hi — Kurashi no Gachois a collaboration with an elderly Japanese self-trained artist recapturing scenes from village life (and satoyama) in prewar Kagoshima. Irish was a major contributor to KJ’s Inaka double-issue (Japanese Countryside, #37), and is currently the head of his village, Tsuchikure, a community of 24 people whose average age is 77, responsible for their general welfare …and organizing monthly village meetings.